The 1,515 km (941 mi) long Mtkvari River (Georgian: მტკვარი) originates in Turkey (where it is called “Kura”) and flows through the broad valley between the Greater Caucasus and Lesser Caucasus mountains and down into the Caspian Sea. The Georgian name “Mtkvari” means “good water”, and in Megrelian – “the river, that eats mountains”. 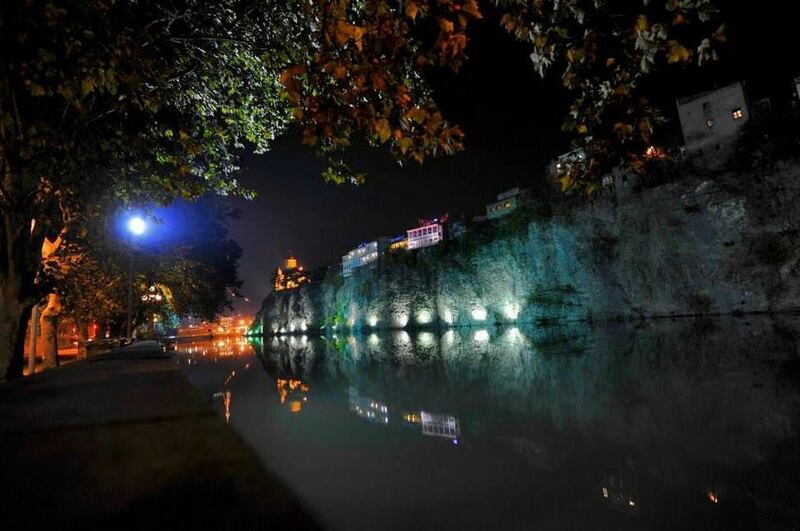 The Mtkvari River at Tbilisi. 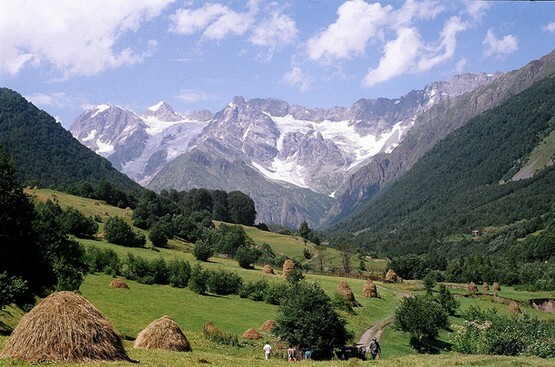 Photo courtesy of the Georgian National Tourism Administration. 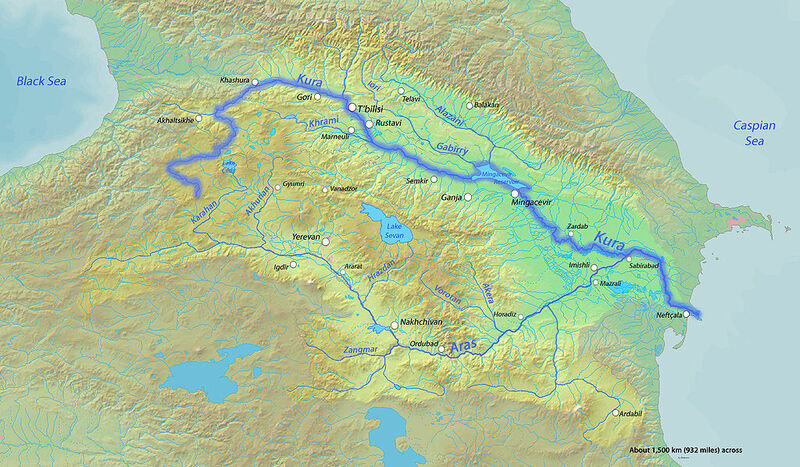 About 174 kilometers (108 mi) of the river is in Turkey, 435 kilometers (270 mi) in Georgia, and 906 kilometers (563 mi) in Azerbaijan. Map showing the Mtkvari River. Wikimedia Commons. 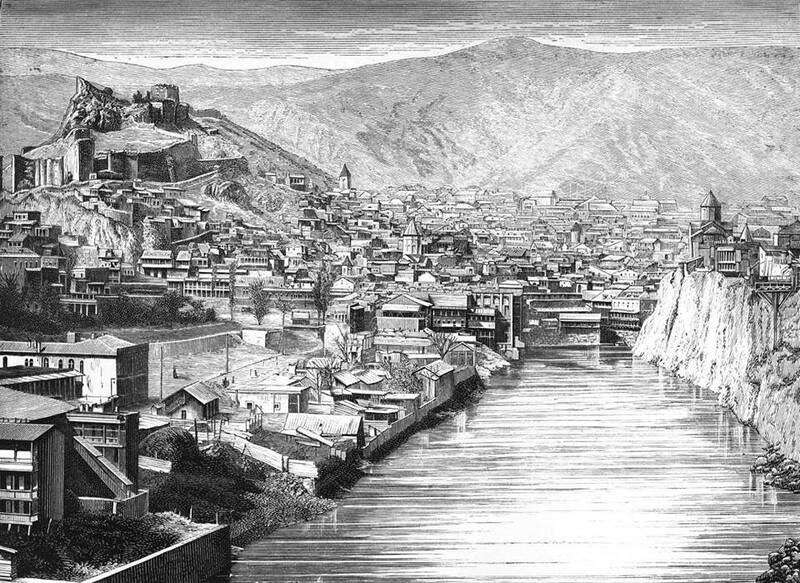 People have farmed and traded by the Mtkvari River for at least 7,000 years, including at Georgia’s former capital Mtskheta (Georgian: მცხეთა) and in the area of the “cave city” at Uplistsikhe (Georgian: უფლისციხე). 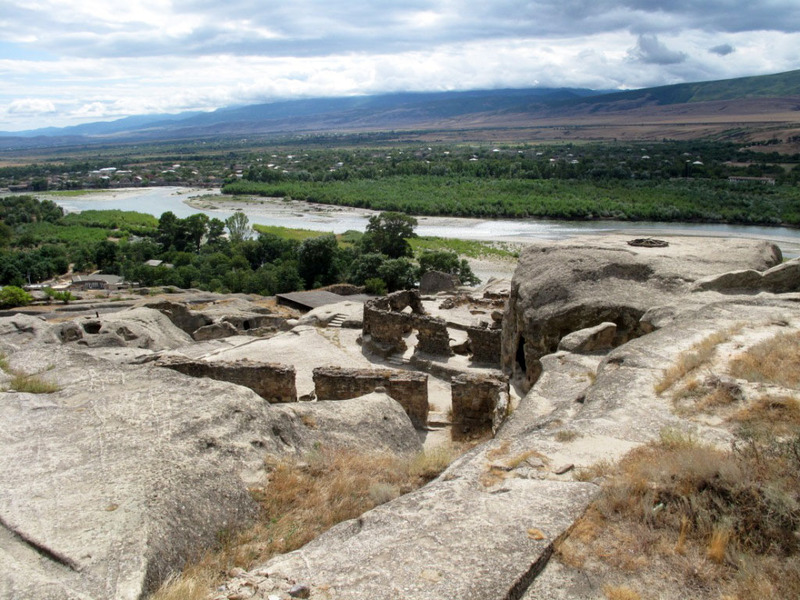 Uplistsikhe dates back as far as the Iron Age and is one of the oldest urban settlements in Georgia. 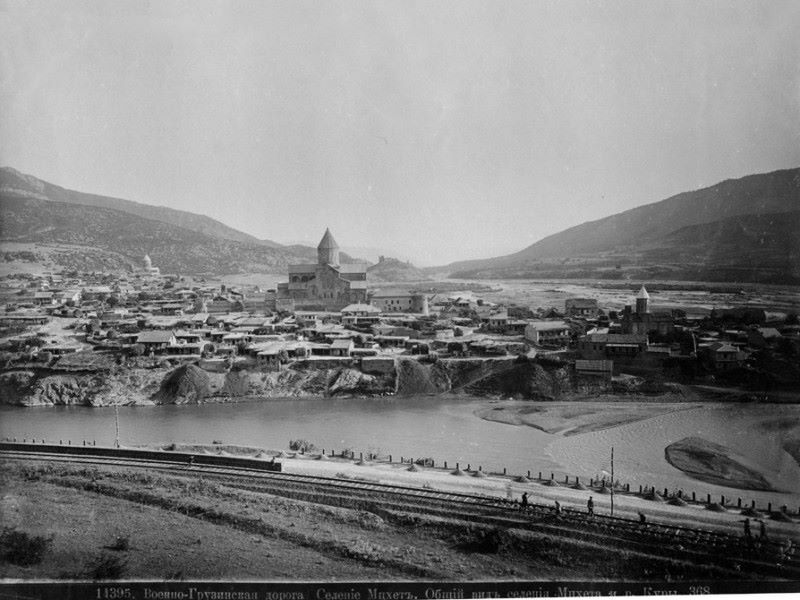 19th century photograph of the old capital of Mtskheta by the Mtkvari River. Photograph by Dmitri Ivanovich Ermakov. In central Georgia, the Mtkvari river carved gorges and ravines as it cut a path through the Lesser Caucasus Mountains where the Trialeti and Meskheti Ranges meet. The most notable of these gorges is Borjomi Gorge (Georgian: ბორჯომის ხეობა). 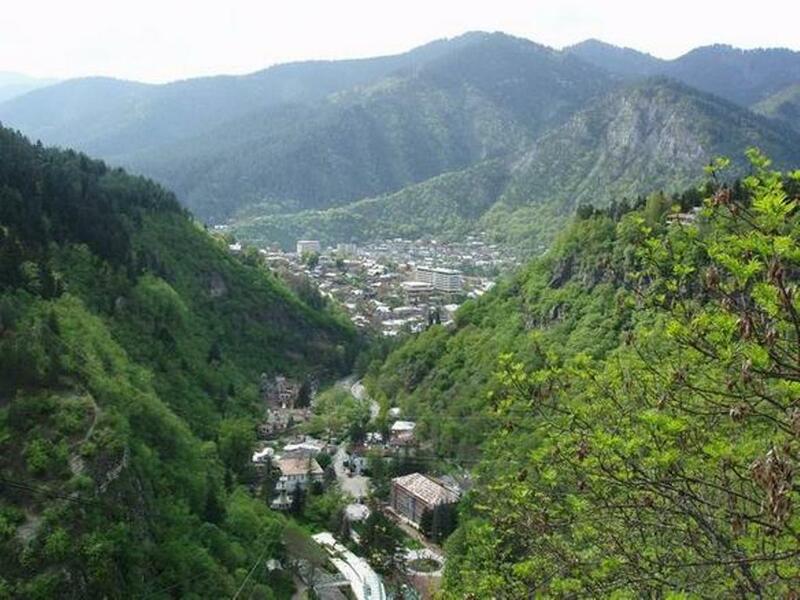 A large portion of the Borjomi-Kharagauli National Park as well as the towns of Borjomi and Likani lie within the Gorge. Georgia’s capital, Tbilisi (Georgian: თბილისი), is the largest city on the Mtkvari river. The city was founded in the 5th century A.D. but archaeological studies have revealed that people settled in the river valley as early as six thousand years ago. 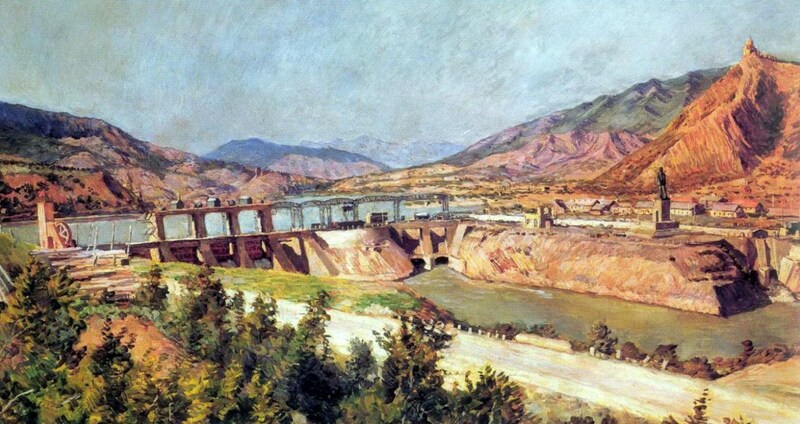 The river was once navigable up to Tbilisi but the amount of water diminished in the 20th century because of the construction of dams for hydroelectricity, reservoirs for municipal needs and through the irrigation of crops. Up to 20% of the water that formerly flowed in the river no longer reaches the Caspian Sea. 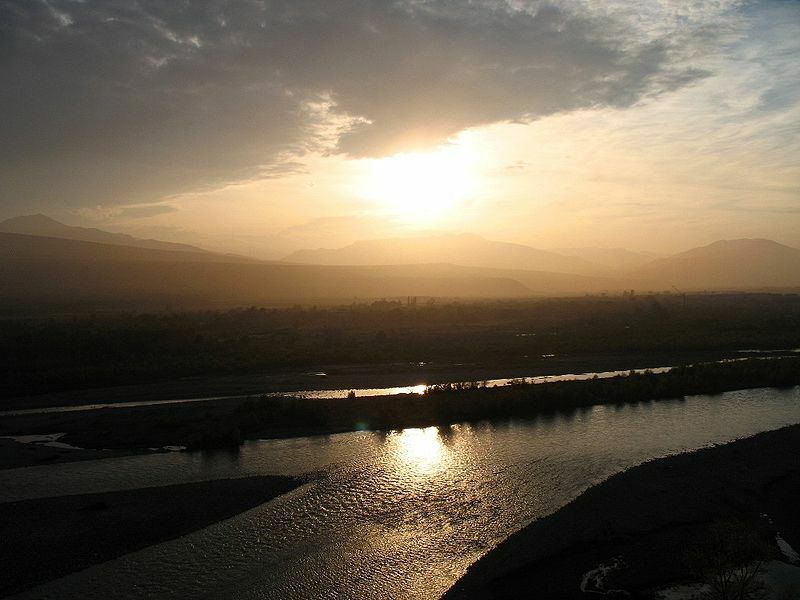 People in the South Caucasus region have been sustained by the mighty Mtkvari river for at least 7,000 years and despite its power being harnessed for modern needs it remains a great river that is interwoven with Georgia’s rich history and culture.